19mm wrought iron. 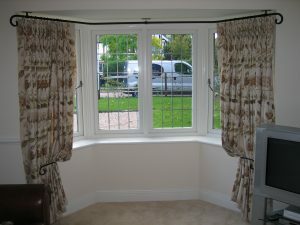 Colours and finials as for Metal Curtain Poles section for straight windows. Measures must be taken by a Fit-ex operative to supply these poles. 19mm Poles complete packs with any type of finial. Can be bent inside an bay and return to the outside if necessary. Up to 480 cm maximum (2 poles, 5 brackets, 2 finials,10 rings per metre).